FIREFIGHTERS IN CORK are to serve notice of industrial action to Cork City Council in a dispute which has resulted from a refusal by management to pay back monies it says are owed to them. Siptu organiser, Con Casey has insisted that members of the Cork Fire Service will strike “imminently” due to the failure of Cork City Council (CCC) to honour an agreement to pay monies due to them under the Public Services Stability Agreement (PSSA). The pay proposals under the PSSA aimed to deliver pay rises of up to 7.4% for most workers and to reverse the financial emergency measures legislation that was introduced in 2009. “Serving the public and keeping them safe is the number one priority of our members in the Cork Fire Service. They deeply regret any action which could give the impression they are not fully committed to their crucial and often dangerous profession. That is why they wish to see a speedy resolution to this dispute. “However, they also cannot accept a situation where agreements that they entered into in good faith are not being respected. Siptu representatives remain available to discuss a resolution to this pay dispute,” Casey said in a statement. Cork City Council told TheJournal.ie that it has paid its firefighters all increases due under the Public Service Agreements. Back monies were due in relation to these increases but Cork City Council is precluded from paying these back monies until the firefighters comply in full with the terms of the Public Service Agreements, namely engage in safety training once more and resume the duties that they had stopped since June 18. CCC has said that the background to the current industrial relations issues originates from the non-engagement of fire personnel in safety training over an extended period. 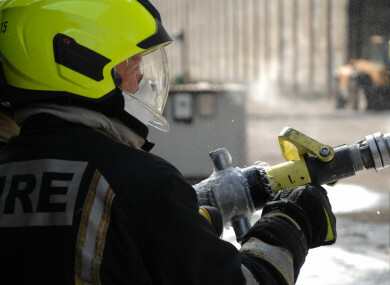 The city council provides an annual training programme for all fire personnel but has said a number of scheduled training courses have had to be cancelled due to the refusal of firefighters to participate. The services of the Workplace Relations Commission and the Labour Court were enlisted by CCC with the objective of ensuring firefighters participate in the scheduled training. “The Labour Court issued two recommendations both of which stated that the firefighters should participate in all scheduled training. In accordance with the Labour Court Recommendations, the city council enlisted the services of the Workplace Relations Commission to assist in bringing all outstanding issues to a constructive conclusion. “However, firefighters in Cork City Council decided to embark on the unofficial industrial action since Monday 18th June, which involves not undertaking the following duties: entering incident calls on the Incident Recording System, undertaking drills & training and limiting overtime crewing. These actions are a complete breach of the Public Service Agreements and established industrial relations procedures and practices. They are a follow on from previous actions which again included non-entering of incident calls on the Incident Recording System and non-co-operation with the introduction of I.C.T. tablets which allow firefighters to access critical safety information at fire locations. Siptu stressed that the imminent notice of industrial action does not relate to the separate dispute concerning scheduled training courses which is to be adjudicated upon by the WRC. “The dispute also predates any attempts by management to enforce new data inputting arrangements on our members. CCC has said that actions of the firefighters involved are a cause of serious concern to the city council and that it is available to meet officially with the staff representative union with a view to bringing all outstanding matters to a constructive conclusion. Email “Cork firefighters to serve strike notice to city council ”. Feedback on “Cork firefighters to serve strike notice to city council ”.